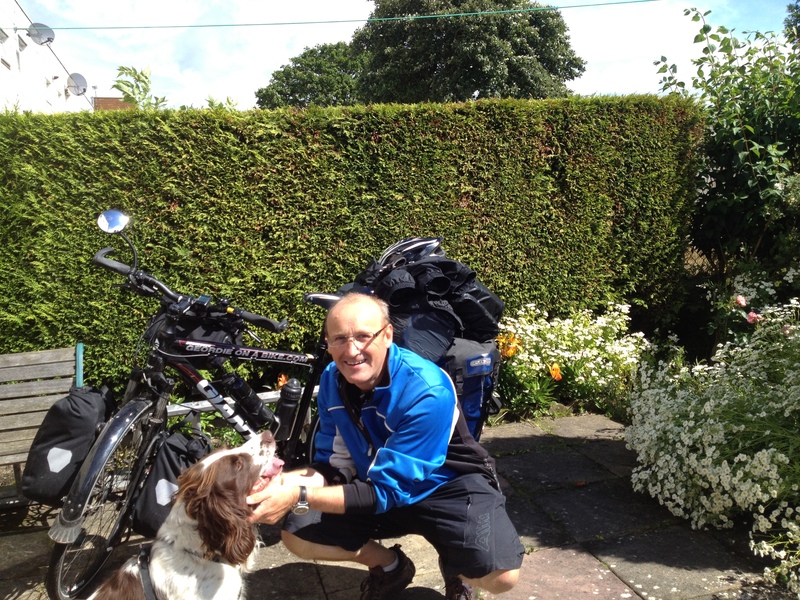 After 3,425 km (2,128 Miles) I’m back at my parents house in Cramlington. Ive felt great all week ,but now I’m back all of a sudden I feel drained. I got back to my parents house at 11am ,and it was SO GOOD to see them and my dog Mitch. This afternoon, I have downloaded all 787 photos from my iPhone to my laptop, and tonight I’m going through them with my elderly dad who has not had the chance to see any of my trip blog. I have very mixed emotions about being back at my parents and it will take a few days no doubt to get to grips again with the reality of everyday life. I will do an evaluation blog, by The weekend, I plan to start work again next week, but for now I need some adjustment time. There are a lot of Thank You’s to be said, some special memories to recollect, and share, then thats my blogging over. I have a life to rebuild.! After saying yesterday that I would have an easy day, how wrong I was. My plan started well. After spending the night camping next to a young family from Durham , I had a nice breakfast of crossiants x2 with jam and made two big mugs of coffee. I left at 11.am my latest start for a nice ride to Amsterdam. The weather was cloudy but warm, that soon changed. The heavens opened and it’s rained very hard all day , that along with a strong headwind was not what I wanted . 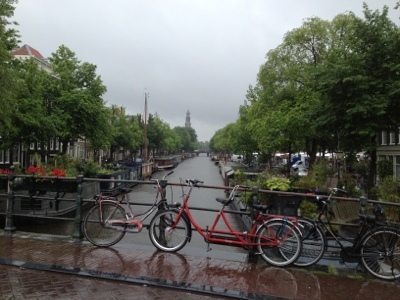 I got to Amsterdam and decided that it was not fun to look around in the torrential rain so took one picture then left. I was going to camp north of Amsterdam but got lost in the rain , saw a sign for Haarlem which I knew was near Ijmuiden for the ferry tomorrow so headed for it. There was NO WAY I was camping tonight that I was certian of. Then on one of the direction notice boards I saw a Stay ok hostel marked in Haarlem so as a member of the youth hostel I used my card to get my own room for €23 . 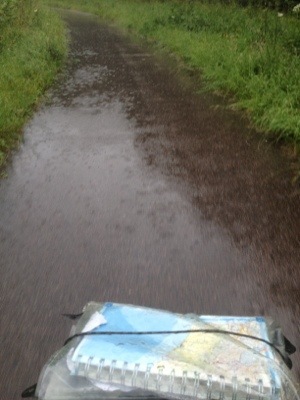 All day I’ve cycled in this . When I was checking in their were puddles on the floor around me from all the rain dripping off me ! I’m now showered , dry, warm and on my 4th coffee . It certainly was not the day I planned but like most of this adventure it’s worked out just fine. I’ve made the decision to honour commitments I have made back home as my first priority , then Its one of two directions my life will go in . I’m not sure which one yet , Time will tell. 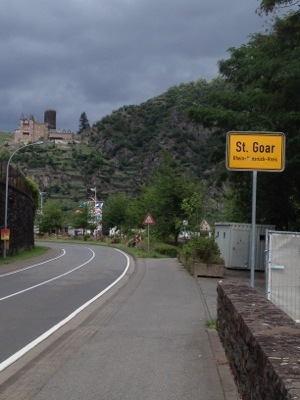 After staying with the wonderful Toos and her fantastic kindness in Horst I set off accompanied by Toos for 28 km , 5 km in the wrong direction because we were talking and I missed the sign! Thank you Toos for your friendship. 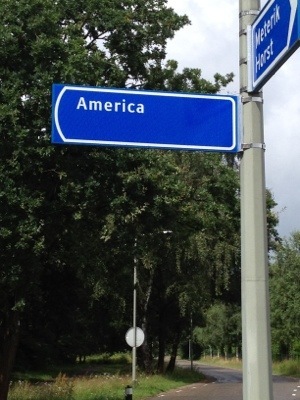 Not long after setting off I was in America ! The weather was not good , strong headwind along with frequent showers and when they arrived they were very heavy. 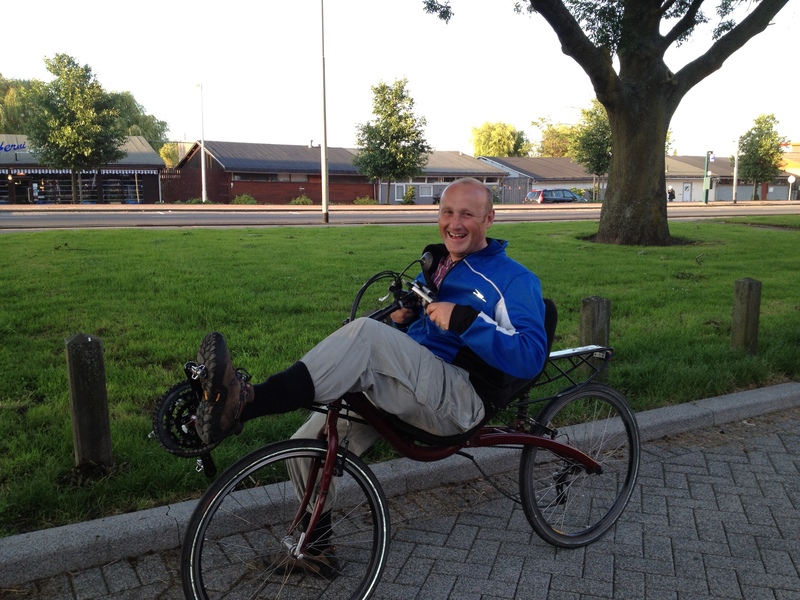 I cycled best part of the day as the ferry is now booked and I have to be in Amsterdam on Tue morn. 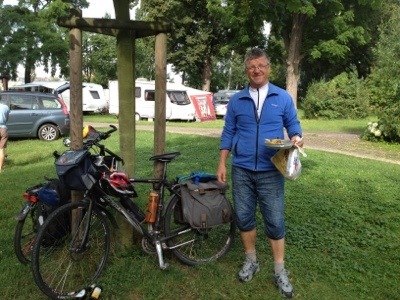 I camped at Kasteren, but the tent site was waterlogged so not very nice! In the morning I quickly packed up and for the first time put the tent away soaking wet. All day as I’ve cycled I’ve been starting to reflect on the last 8 weeks . From leaving home to date , I have had some amazing times, some crazy events have unfolded which you could never of planned , met some fantastic people along the way ,seen some amazing sights , had some very high points ,and some very low moments as well . I want to do an evaluation blog of the trip once I’m back home staying with my parents until I decide my future. Having being through Utrecht twice I decided to bypass the city centre and follow the signs to the west for the outskirts of the city, this proved a good move as it was very quiet and easy to follow . 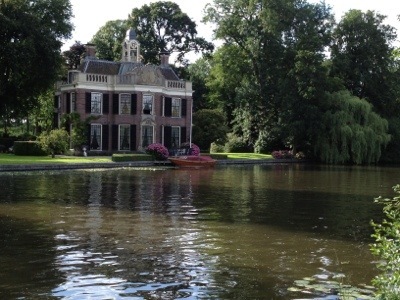 I’ve passed some spectacular houses on the river side at Breukelen so very pretty , so very expensive ! I had a feeling the choice of two campsites in the area would be expensive and so it proved. I’ve reluctantly paid €16 for a bit of grass and a hot shower, whereas most of the other sites I’ve stayed on have been anything from € 5 for one of the best at Armhem to the average of € 10 . 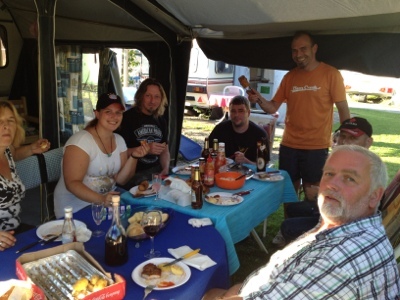 The site is very very nice at Mijnden on the lake shore but it caters more for caravans , passing boats and motor homes than cyclists! It even has a supermarket not a little shop!. I’m only 40 km from Amsterdam so an easy morning is planned with fresh croissants and jam , fresh coffee then a steady ride to a campsite near Amsterdam for my last night before the ferry on Tuesday at 5pm from Ijmuiden back to Newcastle on Wed morn!! My last blog finished with me wild camping on the banks of the river Main at Great Wallstadt, so that is where I will begin this long blog!. 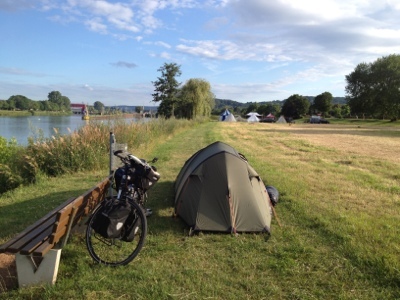 After a good nights sleep on the riverbank, I set off following the river towards Hanau. I then passed Offenbach closely followed by Frankfurt. 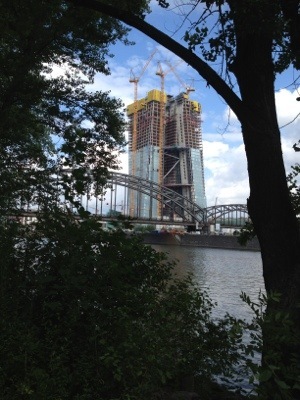 You can tell the German economy is strong from the amount of new building work going on and this very impressive new 125m tall building under construction. 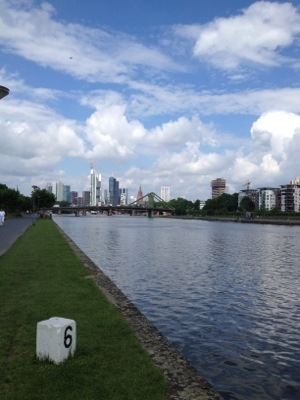 I originally thought I would arrive in Frankfurt at 3pm ,but as the trip has progressed so has the my strength in my legs so Frankfurt was reached at 11.30 am. I had made a request to a Warmshower host but sadly they were working and unable to offer any accommodation. Now when your cycling alone and your bike is your only mode of transport you take extra care of it, and I decided against heading into the city centre to start looking for alternative accommodation with a safe place to leave “George”. As time was on my side, I decided to press and leave the city behind me. 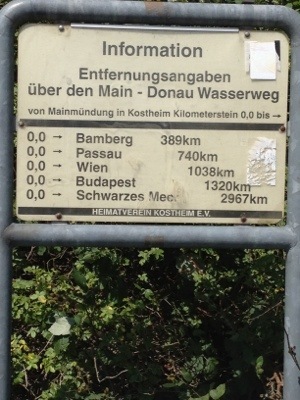 Later in the afternoon I came to the junction where the river Main Flows into the Rhine and the with another great sense of achievement I took a picture of the sign which shows Bamburg as 389km adding to that another 160 to Bad Berneck from where my journey down the River Main began making a total of 549 km. So another tick in the box for one of my planned routes . Another very good site for €8 all in. On the site I met some nice people including Adam from Jersery who was himself taking time out to cycle Europe but covering a lot more countries than me. 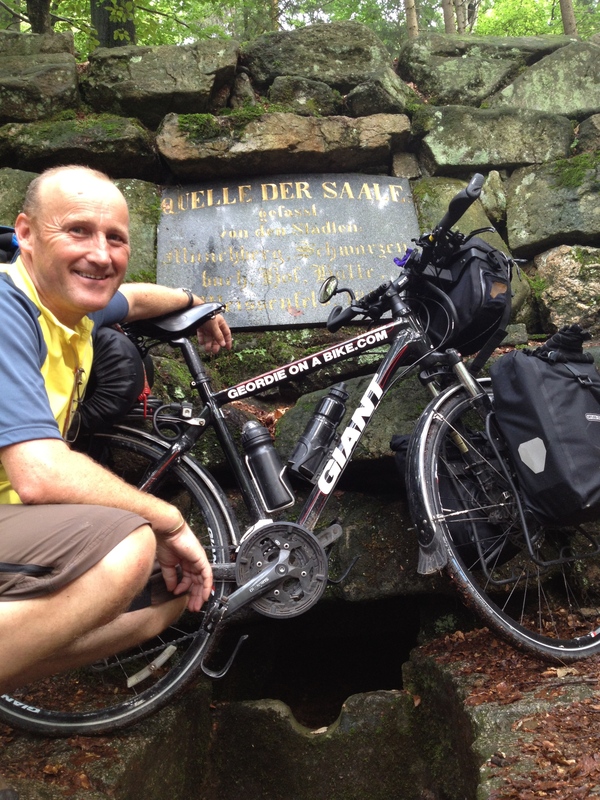 I Also met Peter from Denmark who was pitched next to me and having a 3 week tour , having previously completed the entire North Sea coast route. After a few beers I went just outside the camp gates sat on a bench with my last bottle of beer for the night and took this very nice sunset . At this point my original plan was to head towards Metz in France then down to Montpellier , but as ive always stated from the outset, when I felt the time was right to start heading home then I would, and watching the sunset over Mainz the decision was made to head up the Rhine as far as Dusseldorf then cut across towards the south of Holland then back through Holland to Amsterdam for the ferry to Newcastle. 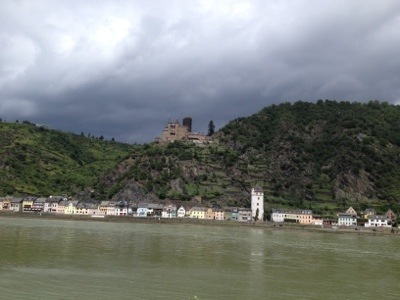 The Rhine was not part of my plan but it made sense to me to follow it for a few hundred Km’s. Still I had not booked the ferry for the return, so decided to press on to see how long it would take me to reach Dusseldorf. 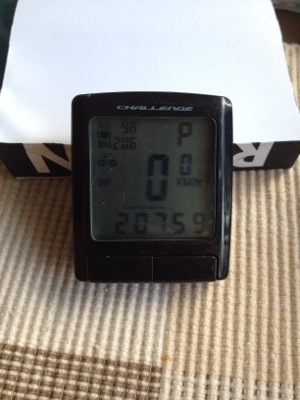 My daily target was approx 100km , and even though i was heading into a headwind i felt amazingly strong. To me the key factor is that im taking time to stop for a good lunch at a cafe or pub/ restaurant along with eating snacks on a more regular basis, basically every hour- two hours. 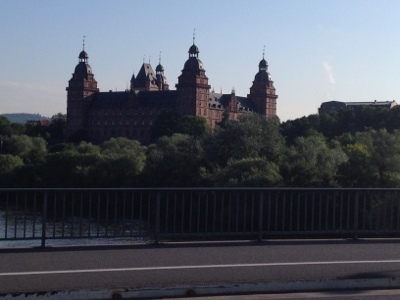 I was going along a good speed of approx 20 -22 km ‘s so Bonn and Koln were reached very quickly. 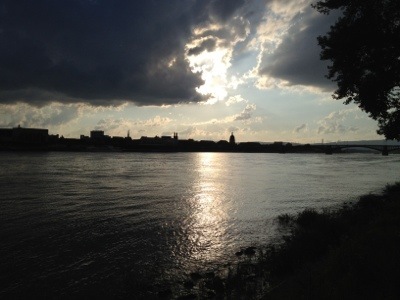 Being honest in my opinion the Rhine is not as nice to cycle as the Main or my favourite so far the River Saale. Its nice but maybe I was spoilt on the previous two rivers! After 7 weeks cycling so far ive been very lucky and never once felt in danger, and my personal choice not wear my helmet , its being strapped to the bike since arriving in Holland, was nearly a bad move 3 times in one day. I know today is Friday the 13th, but my bad day was Thursday the 12th. 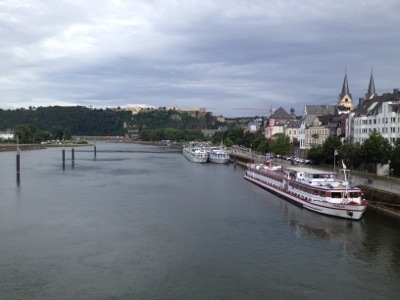 the weather has been very nice for a good five days , but then the rainstorms have appeared again, and event no1 happened near Bonn as I was approaching a couple who had stopped under bridge to shelter from the rain. The lady decided to set of trying to take her jacket off at the same time as cycling and swerved straight across my path forcing me swerve quickly, go onto the road and if a car or something bigger was approaching !!! She apologised for it but it was a close call. No2 happend at Koln when a pedestrian, who I had rang my bell for, to warm them I was behind decided to cut across my path , I locked up my brakes and hit her but not at the speed I was travelling a few seconds ago. She knew it was her fault and in good English said “she was sorry and was I alright”! No3 came soon after and was potentially the worse of all. While going towards the very busy outskirts of Koln down a one way street I was “doored”. Thats where someone without looking opens the car door ,without looking in the mirror to see if anyone was approaching from behind, I was and as Ive read about the nasty consequences of being “doored” I had left just enough space to at the very last second swerve,sharply left and miss the door but causing the car behind me lock up and also swerve to miss me and her now fully open car door! if the traffic had being coming from the other direction I have no doubt I would not be typing this now! I gave her a lot of verbal abuse, which Im not proud of but it was in the heat of the moment and after two previous close calls in a few hours I had had enough. She did not understand my choice words but I am pretty certain she got the message! Now to clear it up, I was not going to fast even though I was pressing on but if I had not being concentrating at the time then all three incidents could have been a lot worse. The River Mossel also joins the Rhine and one day that is a route i would like to cycle as ive heard some very good reports about it. My distances the last few days have been 112km ,134km 143 km, and not once at the end of the day have I felt tired only stopping for campsites, and the sun starting to set. Once I reached Dusseldorf at approximately 7 pm , and now having the “Im ready for home feeling”. I stopped to use my iPhone to go online and book my ticket from Amsterdam to Newcastle for next Tue- 17th July. Again the iPhone has proved fantastic, allowing me to take some great pictures, do my blog, emails and use the sat nav (google maps) when needed. So with ferry booked and a nice warm temprature of 20′ I made the decison to see how close to Holland I could get before dark. Setting the maps for the shortest route from Dusseldorf to Venlo in Holland I cycled on and stopped for a very nice Takeaway pizza and 1.5 litre bottle of coke at 8.30 pm. Quickly consumed and feeling great on I went and then my phone went to say an email had arrived. It was from Tony the lovely lady I met and stayed with in Vorden. she has been following the blog and as I had not blogged for 4 days she sent me an email to see if I was ok. 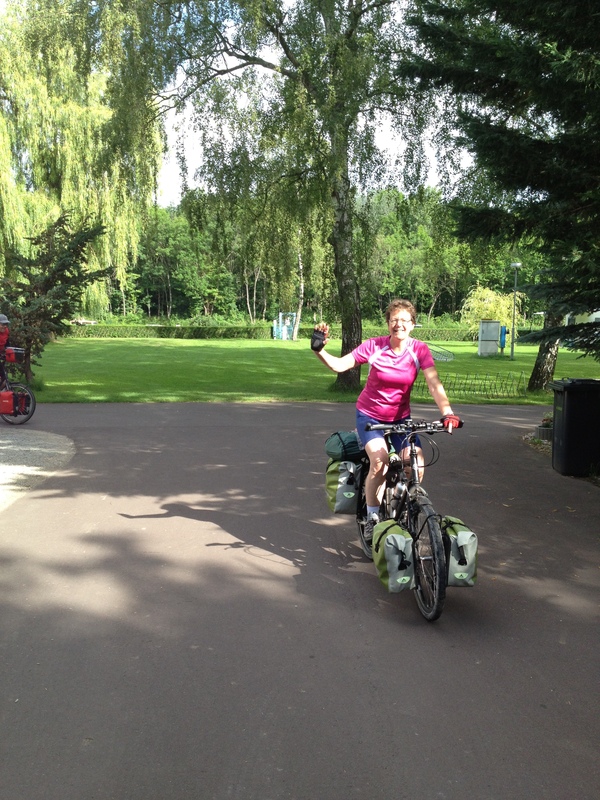 I told her I was heading up the Rhine and now towards Venlo. 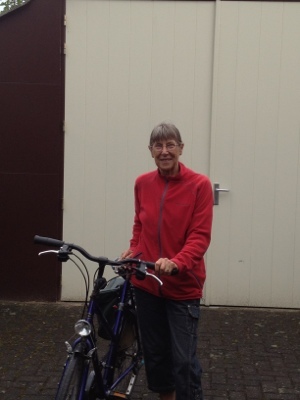 A few minutes later I had a second email from Toos , Tony’s Best friend who She cycles with and we met up all those weeks ago in Harlingen . 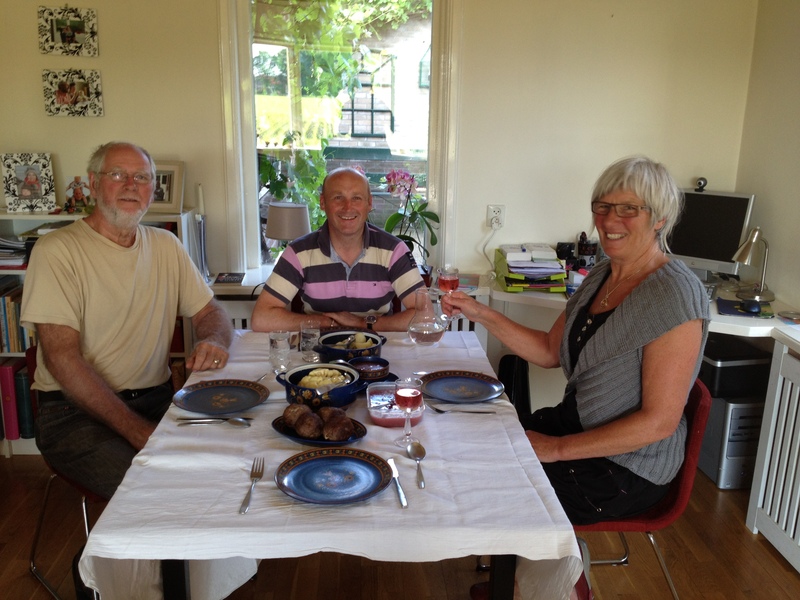 Amazingly she said she only lives 20km from Venlo on the German- Dutch Border and I was welcome to stay with her if I wished. I had just enough battery power left to send her a quick email reply to say I would see her in the morning as the time was now approaching midnight. 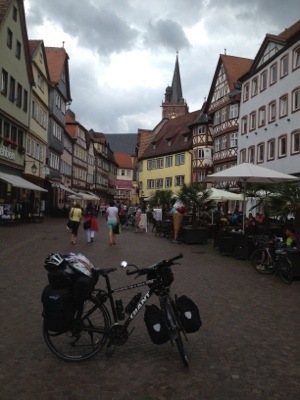 Having made the decision to cycle on in the dark, using my fantastic Petzl headtorch to light the way I arrived at the town of Horst at 12.30 and headed to the town centre as it was now raining very hard. I made the decision to stay in a bus shelter till the early hours of the morning and sat and watched the world go by slowly in the night! At 5 am a guy came out of his house across the street and asked if I was ok, I explained I was going to a friends at 8.30am but was not exactly sure of where it was. He vanished appearing quickly after with a detailed street map showing me exactly where Toos’ house was! this at 5am !!! again the kindness of strangers amazes me. I arrived at Toos’ house. Feeling pretty good for having approx 1 hrs sleep! During the night I added additional layers of clothes to keep me warm and dry from the unrelenting rain, thank goodness for the glass wrap around bus shelter! then called at a local garage at 6 am once open to consume two cups of coffee, and then the bakers for warm croissants before meeting Toos. we’ve had a second breakfast, Ive had a very nice warm shower, 3 hrs sleep and now while Toos does her job in the Tourist information office Im telling you about my last few days of craziness! Im staying here until tomorrow morning then starting the ride towards Amsterdam, looking for somewhere to say two nights then the ferry from Ijmuiden back to Newcastle arriving on Wed 18th July. You will have to put up with a few more blogs as I feel I still have more to add to this crazy adventure , then its decide my future time!. Thanks for your patience reading this blog . 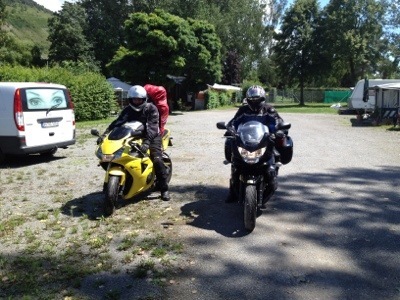 I know its long but so has this adventure, now having covered 3112 km so far ! Just under 2000 miles. 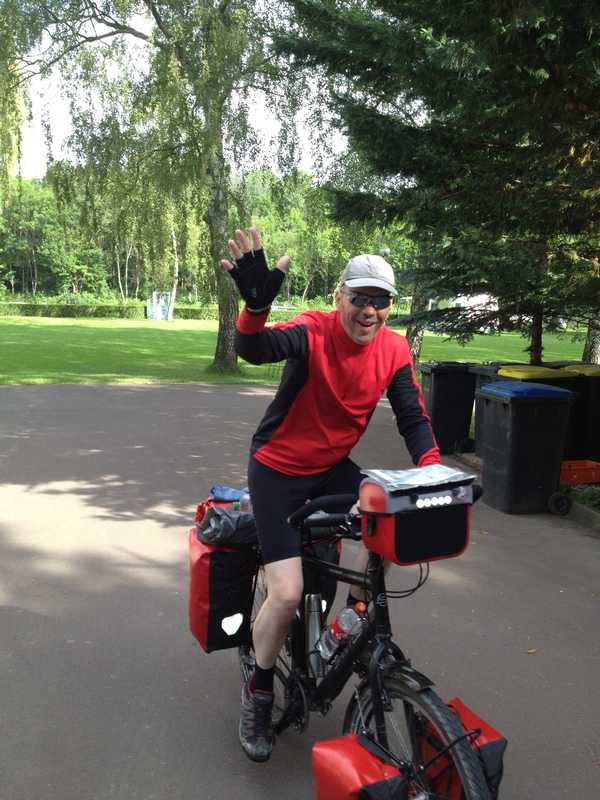 After my 3 days rest at The fantastic Zellingen I set off at 8.45am with the intention of covering about 100km. The river Main twists and turns in huge sweeping curves like when you shake a child’s skipping rope. There are lots of potential shortcuts but I chose to stick to the river route per my original plan. “George” my bike had a quick service at the weekend and fresh oil applied,his 3rd of the trip . I felt really good today , the weather has been kind , cloudy but warm 23′ soon I was at Lohr then Markt-Heidenfeld passing some very pretty places . 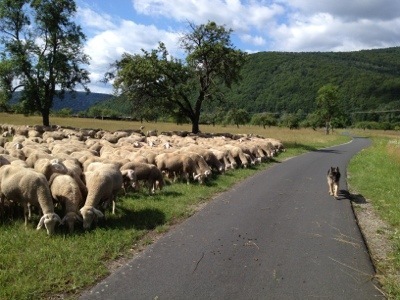 I stopped for a few minutes to watch a German Shepherd dog working the sheep and a great job he was doing . 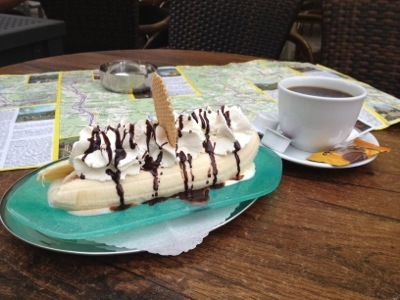 Lunch was taken at the very pretty Wertheim , a Great banana split , along with two cups of coffee . 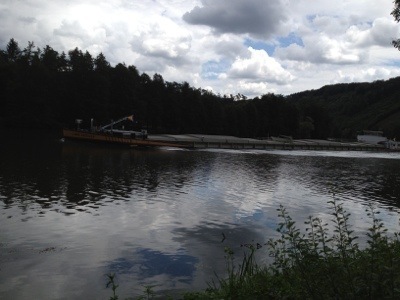 On the river you see many of the barges plying their trade , carrying all kinds of cargo. Today I passed this barge and if it had any more cargo it would be officially classed as a submarine!! The water was only cm’s from lapping over the sides! 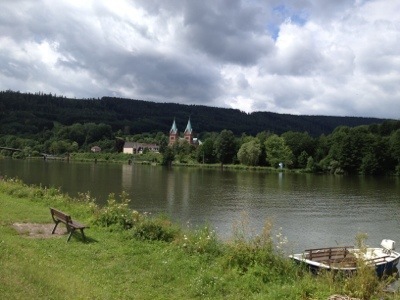 Soon after I passed Miltenberg and still feeling great rode on . 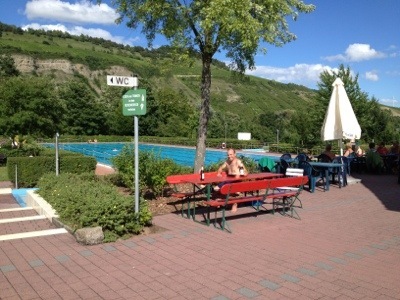 I’m now at Gross Wallstadt , camping on the riverside for free . The has been some kind of festival and there are a few groups of people still camping so I asked if it was ok for the night , they said “yes” so here I stay until the morning then head to Frankfurt . 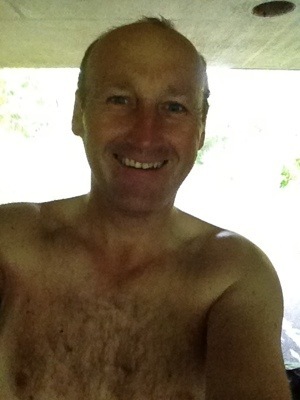 I’ve put in a warmshower request but as yet heard nothing so time will tell . 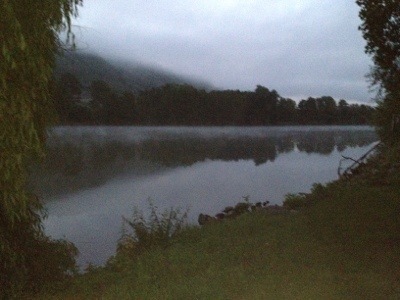 If not I have other options open to me as there a several campsites along the river. Today I’ve cycled 146km ( approx 85-90 miles , feel fantastic . It’s another very nice evening and now I’m going to make myself something to eat. Again I have been amazed at the kindness of people and the friendship they have shown. Last night along with Nico and Ralph I was invited to a Barbecue . The person holding the party was Nina, along with her partner Footsie,and her very pretty 7 yr old daughter, and Nina’s mother. We ate very well and the food fantastic. I took along 6 beers , my Iphone with all my music on, which ended up playing a lot of Bob Marley and we drank just about every kind of Schnapps that there is.! My favourite and probably the funniest name was “feckin” We got through two bottles of that alone! I also showed my skill ! 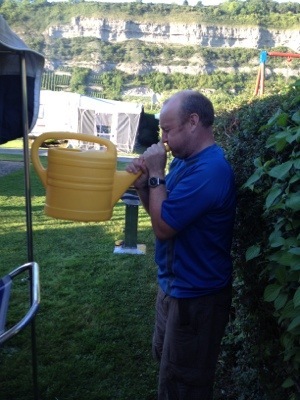 at playing the watering can! The party went on till 5am then I walked backed to my tent to this very nice view . My plan was to stay 2 days but as I’ve only had about 4 hours sleep and was very tired ,even though i was amazed at the fact i did not have a hang over at all, I was going to cycle on. Hearing the rain on the tent was not a good start but I started to pack up ready for leaving. Then i got invited to breakfast so by the time that was over, it was 11.30am and the sun was starting to come out. I thought to myself “Have another day, Its a great place, great people, then start again in the morning”. A very wise decision. I wish to thank NIna , and all her family, friends for a fantastic night. – Prost. Ralph, who is a miner and Nico were setting off and they have been great guys to camp next too and talk with. Ralph spoke good English and helped me learn more German! 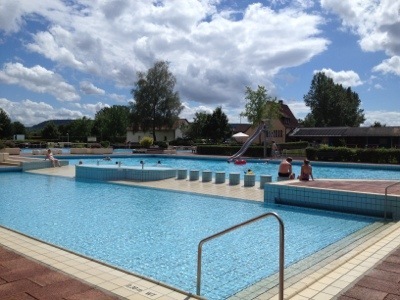 I was going to just chill out this afternoon but got invited to the outdoor swimming baths next to the site with Nina, Footise, and Leah. After their kindness last night I paid for us to get into the pool, €9 which was a bargin for this . The water was cool but by no way cold and it was great to be able to get some decent swimming time in. 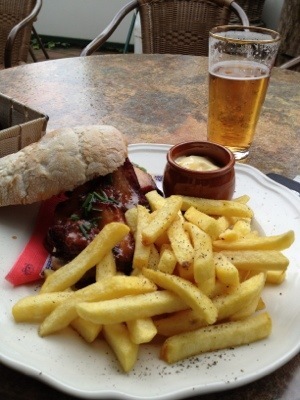 At 5.00 pm I had burger and chips, and we left at 5.45 pm. Im now really tired, the site is almost deserted as most of the people are weekenders , but Nina, Footsie and her daughter are still here for the moment, setting off soon to head back home. My plan now is to enjoy the evening sunshine, have a single beer, relax and get an early night ready for a start at 7.30 in the morning. 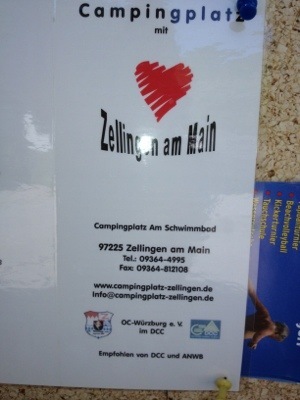 Thank you everybody at Campingplatz Zelling am Main.